The annual report on antisemitism in Australia has shown a 9.5 % increase over the previous year in total antisemitic incidents in Australia involving threats or acts of violence. The Report on Antisemitism in Australia was published by the Executive Council of Australian Jewry and covers the 12 month period ending on September 30, 2017. The ECAJ, Jewish community roof bodies in each State, and other Jewish community groups logged a total of 230 antisemitic incidents during the period, including physical assaults, abuse and harassment, vandalism, graffiti, hate and threats communicated directly by email, letters, telephone calls, and leaflets . This compares to a total of 210 such incidents logged by the same sources over the preceding 12 month period. 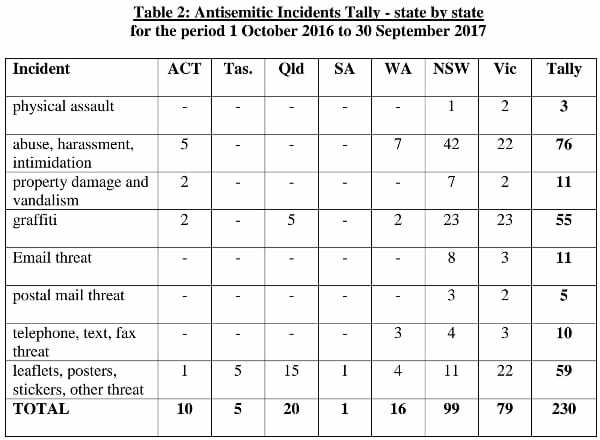 The table below showed NSW experienced 99 incidents with Victoria reporting 79. South Australia reported only one incident . Perhaps one of the most unusual incidents took place in a Sydney supermarket when pork chops were deliberately placed at the back of the kosher meat display. Attacks (assault, abuse, vandalism, and graffiti) accounted for 63% of the total number of incidents, with 14 incidents. Threats (email, letters, telephone, leaflets) accounted for 37 % of the total number of incidents, with 85 incidents. There is also much anecdotal evidence of incidents which go unreported . Overall, the number of ‘attacks’ remained relatively unchanged, while ‘threats’ increased by 39%, between 2016 and 2017. There was a marked increase in antisemitic graffiti and posters ; and a decrease in assault, and vandalism, and a slight decrease in harassment. The report’s author, the ECAJ Research Officer, Julie Nathan , said: “The most prominent change over the last twelve months in Australia has been the rise in extreme right – wing activity. This new development has predominantly been through the activities of a small neo – Nazi group, Antipodean Resistance, formed in October 2016 . It originated in Melbourne but now has chapters in most other states. So far, their activities have involved putting up thousands of Nazi stickers and thousands of anti – Jewish, anti – homosexual and pro – Nazi posters, especially at universities and other places visible to the public. This has caused great concern especially within the Jewish and gay communities. Some of the Antipodean Resistance posters express support for violence and murder, calling to “Legalise the execution of Jews ” and for the killing of homosexuals, by shooting Jews and homosexuals in the head.